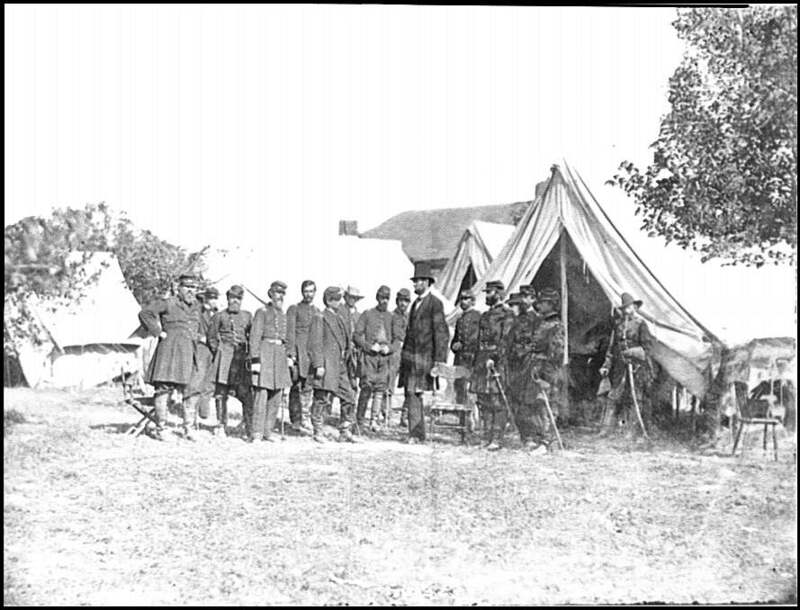 The complete photo is at the Library of Congress Online, and is part of their Civil War Photograph collection. See more about the occasion of President Lincoln's visit with General McClellan in a Featured Exhibit. 1. Col. Delos B. Sacket, I.G. 3. Lt. Col. Nelson B. Sweitzer. 4. Gen. George W. Morell. 5. Col. Alexander S. Webb, Chief of Staff, 5th Corps. 6. Gen. George B. McClellan. 8. Dr. Jonathan Letterman, Army Medical Director. 11. Gen. Henry J. Hunt. 14. Col. Frederick T. Locke, A.A.G. 15. Gen. Andrew A. Humphreys. MEDIUM 1 negative : glass, wet collodion. NOTES Civil War photographs, 1861-1865 compiled by Hirst D. Milhollen and Donald H. Mugridge, Washington, D.C. Library of Congress, 1977. No. 0148. Photograph from the main eastern theater of the war, Battle of Antietam, September-October 1862. * I have received some email from a woman who says this man is her GGGGrandfather Joseph Avey (or Eavey), that he had a farm at Sharpsburg, and it may be his house in the background of the (full) picture. I cannot confirm the identity of the man myself, but his Army cap suggests he is a Federal Officer. ** Mr. Frassinito is sure this is Capt George Custer, and makes an excellent case in his Antietam book. Capt Custer was on General McClellan's staff during the campaign. That sure looks like a cavalry saber he's wearing.